Below are spoilers for both Captain America The Winter Soldier and ABC's Agents of SHIELD. IF you've seen both Captain America The Winter Soldier and Agents of SHIELD (AoS), you will apparently realize two things: Something's afoul within the organization of SHIELD (per AoS) and that there is a large organization behind the "afoul" developments in SHIELD (per Cap 2). That foulness is the classic arch enemy of all Marvel characters, Hydra. And Hydra has infiltrated SHIELD, and that infiltration is going to impact the weekly TV series from ABC, Agents of SHIELD. Turns out that now that we've discovered from the most recent Marvel Cinematic Universe movie that with Hydra having infiltrated SHIELD, our heroes from Agents of SHIELD will be finding themselves on the outs, fending for themselves. That means that the team has no more support from the big central agency and whatever tools and toys they have with them, is all they've got. 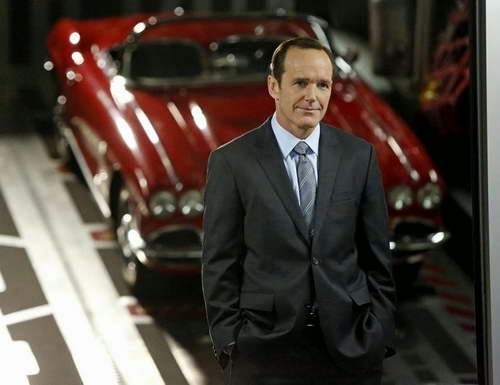 So Agent Coulson's (Clark Gregg) team — agents May (Ming-Na Wen), Ward (Brett Dalton), Fitz (Iain De Caestecker), Simmons (Elizabeth Henstridge) and Skye (Chloe Bennet) will, as exec producer Jed Whedon called them, a "ragtag group" scraping by on their own as they face off against new enemies. Who are those new enemies? Well, as you know, our team had been dealing with people like the fake Clairvoyant, (He had intel that was only gleaned from communications from within SHIELD, not by super mental powers), or Centipede and their Extremis tech, or the most recent new challenge, Deathlok, played by Whedon alum J. August Richards, we're now going to be seeing that the new big bad guy is HYDRA. All the changes, as noted in a USA Today article, were coming, but in a secret way that the network could not reveal, out of worries of spoiling too much for the Captain America 2 movie. And that all sounds fine and good on the outside, but to be honest, as TV and movies rarely ever co-exist, having had teasings and developments take place in this show might not have given anything away except to the masses of hopeful TV viewers who desperately wished that the show would actually get better. And it smells like maybe more of an excuse. Though the show started off with a ratings bang, the ratings devolved over the weeks. The writing was, as many noted, atrocious. I could attest to the questionable writing, as in the beginning, there were quite a few different writers being accredited for various episodes, and until the "big reveal" of how or why Agent Coulson was alive, we had a stupid amount of dropped verbal references about his mystery in every single episode. And other episodes, on occassion, had our heroes tackling unnamed, big enemies, with the stories being concocted as if two children in a sandbox were making up nameless bad guys on the fly. It was pretty amatuerish and showed a complete lack of trust in the viewership's intelligence. But since the big reveal, things have started to flow forward and the real story started to develop. And the characters started to develop and gel. Or as many fans have been hoping, that famous character ensemble lore that Joss Whedon is so famous for would come to the forefront of the series. But Joss only got the show started, and he left the rest in the hands of his family and trusted peers to exec produce, like Jeph Loeb, Maurissa Tancharoen and Jed Whedon. But it had not been panning out. Now, as Agents of SHIELD moves forward, there will be more consternation about the problems with SHIELD while dealing with HYDRA. And that's the big spin/pitch from Disney/Marvel/ABC. That their Agents of SHIELD TV series is going to get explosively better. Or is this just opportunistic marketing that we'll see with every new Marvel Cinematic Universe movie that comes out? And my personal grumble... will they start using the same writers across episodes, stop working from an episode outline guide, and start getting more consistent in trusting their viewers to be smart enough to follow subtle hints, and not two-ton clues dropped every fifteen minutes per episode? That, and they need to add just a few more dollars to the effects of the series. The flying car scenes have been a bit unpolished and did you catch that giant jump/drop that Deathlok took in the last episode, it felt like a Syfy channel special effect. Yep, the ratings will tell all over the next few weeks, as will the writing and story developments.